Set out on new adventures in this 4308 Ventana class A motor home by Newmar. 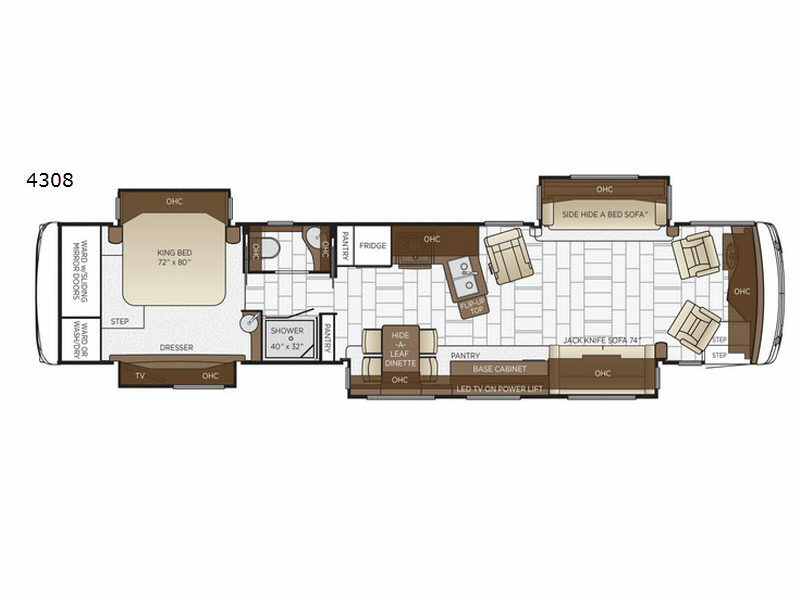 You will love all of the floor space throughout this model thanks to the quad slide outs. In the spacious living area there is a nice conversation area and seating at the hide-a-bed sofa, the 74" jack knife sofa, the lounge chair, plus the driver and passenger seats swivel around! Heading toward the rear of this model you will come to a walk-through bathroom which has a private toilet area. In the rear bedroom there is a king bed and in the corner of the room you will find a convenient sink. For true comfort and relaxation on any trip whether you are traveling near or far you will want a Newmar Ventana class A diesel motor home. These models are a cut above the rest with frameless double-pane tinted safety glass windows and a skylight above the shower which adds plenty of natural light. You will love the Bermuda Glazed Maple cabinets and the polished solid surface counter tops in the kitchen. When you need to get a little work done then simply set up the passenger seat work station. The polished porcelain tile floor in the kitchen, bathroom, and living room is beautiful, easy to clean, and durable! Get ready for any adventure with a Newmar Ventana!